​The Haflinger is a native horse of Austria, evolving in the Tyrolean area of the Alps. The breed takes it’s name from the village of Hafling, now part of Italy. The Haflinger is believed to have originated when an Arab stallion, El Bedavi, was used to settle a mountain pony. The resulting colt, Folie, born in 1874 ,is considered the father of the breed. Haflingers were imported into the United States in 1958 by Temple Farms of Illinois. The first Canadian Haflinger was registered in 1977. In 1980 the Canadian Haflinger Association was founded. In the ensuing years the association has grown in membership to over 250 members and has spread right across Canada, with over 1000 horses registered. There has always been quite close line breeding within the Haflinger, therefore the breed has a very similar type, color and appearance. 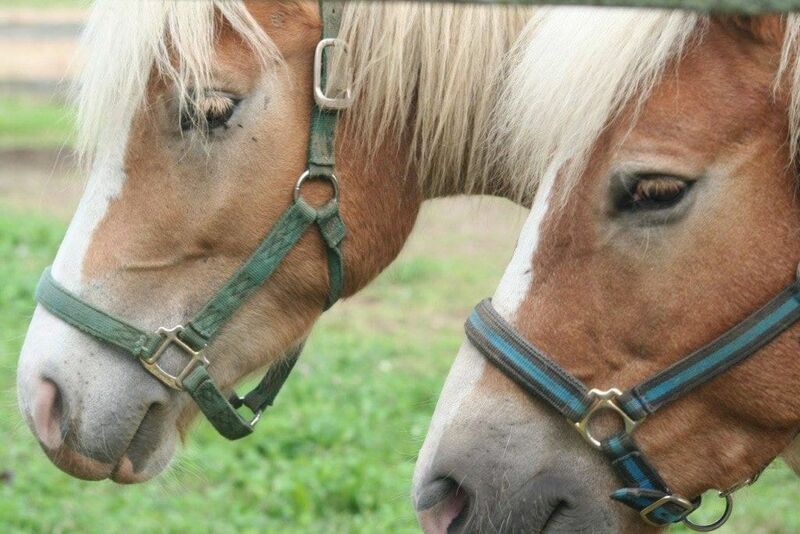 The Haflinger ranges in height from 13 hands (52 inches) to 15 hands (60 inches), weighing in at 800 to 1300 pounds. Haflingers are always chestnut in color, varying in shade from blonde to dark chocolate. The manes and tails are one of the breeds most striking characteristics, being long, thick and flaxen to white in color. A strong, arched neck supports a well shaped head that is flat or slightly dished and broad, with wide spaced eyes and small ears. The body is broad, deep and muscular with strong legs and relatively large, strong hooves. Due to their mountain ancestry, Haflingers are easy keepers. Haflingers do well on little or no grain and limited hay or pasture. They are extremely long lived, with mares producing foals well into their 20’s and living into their 30’s. If a word could be used to describe the performance of the Haflinger it would be versatility. In Canada Haflingers excel in all manner of equine endeavor. Haflingers in heavy harness are a real crowd pleaser at draft shows and parades. As well, they work diligently in the bush or fields, pulling a surprising amount of weight when compared to the larger breeds of draft horse. Haflingers also excel at combined and pleasure driving where their steady tempers and eye- catching good looks stand them in good stead. Calm and willing describes the Haflinger temperament, there is nothing “Pony-like” about them, making them ideal mounts for children, and the disabled, also they are well up to the weight of adult riders. Their gentle and quiet nature makes them ideal family horses. Their mountain ancestry has given the Haflinger an incredible amount of stamina and perseverance, and this combined with their strength and calm nature make Haflingers ideal for trekking, trail riding and endurance riding. Haflingers are, as a rule, good jumpers with nice form over the fences plenty of impulsion. In the dressage ring the Haflingers willingness, trainability and steady nature not only make them a delight to work with, but stand the Haflinger surprisingly well in open competition. No matter what your horse sport Haflingers are sure to please. The great beauty of the Haflinger, with it’s flowing white mane and tail, it’s ease of movement, combined with it’s quiet intelligent nature makes the Haflinger the perfect family horse.